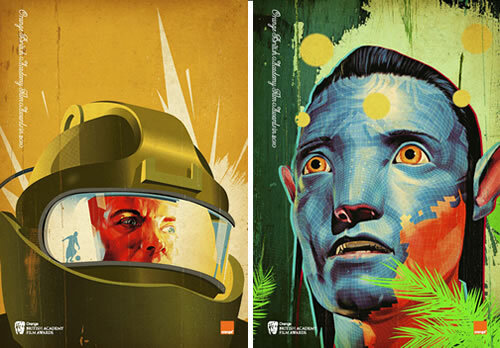 When Tavis Coburn of the UK advertising agency Dutch Uncle was approached to put together some movie posters to honor the 2010 BAFTA Awards, he drew his inspiration from the past, rather than the future. The end result is a group of incredible retro movie posters for the biggest critical hits of 2009-2010, including An Education, The Hurt Locker, and Avatar. As an admitted movie nerd, I absolutely adore an instantly distinctive movie poster, and no movie posters were better than those of the 40’s and 50’s. The move to Photoshop and photographs in general, rather than meticulously designed graphic art like that used by Saul Bass has really hurt the selling of movies. I mean, before you touch a computer, you should be forced to learn how to do things the right way. I think that’s the secret to why some people, like James Cameron, can use special effects properly, and some people (Michael Bay) fail at it.